In the wee light of early morning I slipped down into our critical care area. There a wonderful sight awaited me. 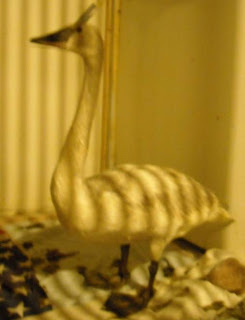 Our cygnet Trumpeter Swan (#21) was standing! This is a huge milestone for us and the swan of course. This is the youngster than was admitted with lead poisoning last week. When admitted she weighed less than ten pounds or half her normal weight. She was so weak she was unable to stand and most of the time was unable to hold her head up. She was unable to eat on her own. While we are still guardeded about her survival we are now guardedly optimistic! What a little fighter this youngster is! She is eating on her own now! As of Saturday March 6, she weighted 12.5 lbs. We are anxious to weigh her today and see what the scale says. If this little one has her way she will be out of here and back to the wild sooner than we ever dreamed just a short week ago. Lead poisoning is a very difficult toxin and does terrible things to the organs including the birds heart, kidneys and liver. She will have many hurdles to overcome in the future but the first step is to stay alive long enough for the lead chelation medication (Ca EDTA) to take affect and to be able to digest food. That first step has been taken and we are on to the next. This little lady has a strong constitution and we will do our very best to make sure she can go home again. 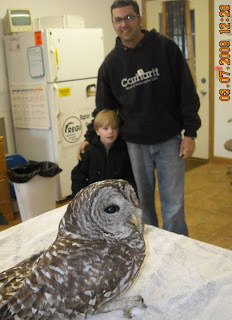 The Barred Owl on the left was admitted on Saturday March 6, 2009. A family found the bird at the side of a road and brought him to REGI. The owl is an adult male Barred Owl. The species while common to our region is one of our most beautiful owls. Barred Owls are early nesters. It is very possible this adult male has a family or at least a mate sitting on eggs. We hope he can get back to his family soon. Many owls are hit by cars. This happens for a few reasons. First owls use their hearing more than their vision when hunting. If they are hot on the auditory trail of a mouse, which is their most common food, they are so focused they are not aware of cars. Since owls are active at night and our vision is low at that time, people do not see them until it is too late and they are on a collision path. 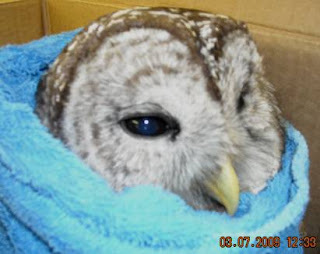 This owl was rescued an d was brought to REGI. The gentleman brought his young son along to admit the bird. It is so important to include youngsters in efforts to help animals. We at REGI believe children learn what they live. A parents actions become a part of who they will be in the future. We applaud this family for taking time to notice the bird and get him the help he needed.